When a secret agent's wife is viciously murdered, instead of allowing the police to handle finding the serial killer he sets out to find and punish the killer himself. Each new film director Kim Jee-woon makes is an effort in a new genre. He has tried his hand at crime with "A Bittersweet Life," paranormal thrillers with "A Tale of Two Sisters," even western with "The Good, The Bad, The Weird" and now with "I Saw the Devil" he's plunged into the revenge/torture genre. This latest effort is a powerful example illustrating his keen understanding of how to play with yet pay respect to each genre of film. Kim Jee-woon may not be breaking any new grounds with 'Devil' however he certainly shows his mastery in the art of direction. The thriller doesn't necessarily cover new ground in the dichotomy of vengeance, it does however give a lengthy and brutal account of two men's cat and mouse game of trauma. While feeling like the film sympathizes with the agent who has lost his wife, the thriller is more a peering into the escape and mindset of the killer who is now being hunted. The story essentially flips itself. While you feel compassion for the grieving husband you end up appreciating the tenacity of the killer. A sentiment I struggled with while watching. I found myself questioning my own morality and my own beliefs surrounding revenge and vengeance. You begin to question repeatedly, who is winning this battle and at what cost? The answer to that question you will have to find for yourself within "I Saw the Devil." 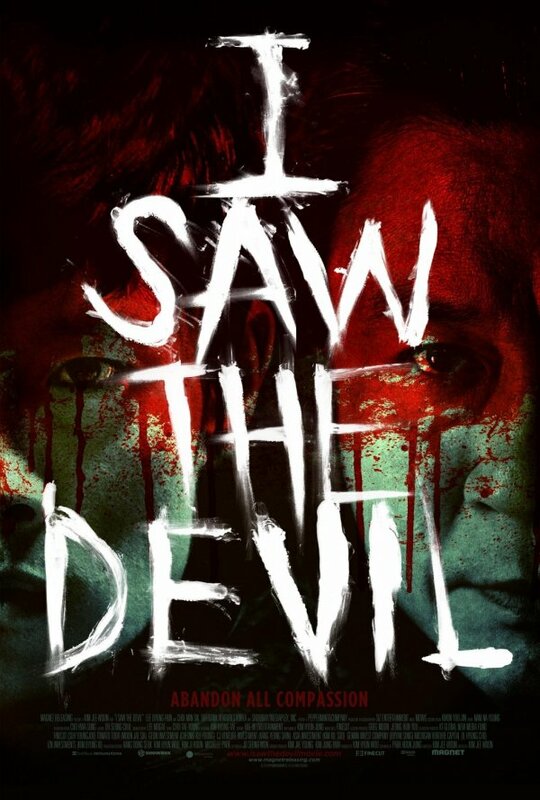 "I Saw the Devil" is the "Heat" of revenge movies. It is a slow and calculated effort by Kim Jee-woon that focuses not only on psychology of revenge but also the chess match between two veteran killers. Slow may be the wrong word to use although, because I never felt the film moved slowly. You do wonder how much further will the film go and at what lengths. It is a afterall a very lengthy lesson is brutality and trauma with a running time of 140 minutes. Speaking of brutal, 'Devil' pulls absolutely zero punches. The film is drenched in blood and grit. Particularly blunt force trauma. Where in a Shogun film we can expect to see limbs to be chopped off, here you can expect to see plenty of bashing. Most of which is aimed directly at the head. Every once in a great while a scene or shot comes along that just breaks down what we've thought possible before with cinematography. For instance the bullet time in "The Matrix," or the one take hallway sequence in "Oldboy." Those scenes blew us away and changed what we thought possible with a camera amidst a bunch of action. "I Saw the Devil" features a new milestone with a 360° sequence. We have a triple stabbing shot that takes place in a car giving the viewer vantage to every possible angle of the vicious attack inside of the car. The sequence is mesmerizing and practically reason enough to track this film down. Seriously, the shot is something not to be missed leaving the viewer questioning just how they pulled it off. That is not the only jaw dropping sequence within 'Devil,' there are a number of other scenes that will have you (as well as the crowd) suspended in disbelief and/or oohing, awing and most likely cringing. The performances throughout "I Saw the Devil" are infecting. Both Lee Byung-hun as Kim Soo-hyeon and Choi Min-sik as Kyung-Chul are the two best opposing characters you could've hoped for in a revenge film. While both of the Lee and Choi's performances are electric credit must be given to Park Hoon-jung for writing two characters who come across as each other's intended rival. Both men appear to have met their match in the opposite and watching their exchanges play out is phenomenal. Choi Min-sik who has been absent on screen since 2008 returns with an intensity and vigor that nearly jumps off the screen. Choi pulls off such a frenzied performance as the serial killer it is doubtful this performance goes forgotten. Dare I make it, but Choi is eerie enough in this performance to draw comparisons to Hannibal Lecter. I wouldn't say Kyung-Chul is anywhere near as intelligent as Lecter but uncannily vicious, absolutely and Choi Min-sik pulls it off without breaking a sweat or batting an eye. Lee Byung-hum too is fantastic as the grief stricken husband that is hell bent on repeatedly punishing the serial killer who took his wife's life. While I loved the performances, the character of Kim Soo-hyeon represents my problem with the brutal thriller. It becomes clear at a certain point that there is no winning in his quest. The loss he has suffered is so great that no amount of brutality inflected on the serial killer will heal his pain. At the same time I feel Soo-hyeon's journey teaches him that his vengeance will not offer redemption, which is just as important as him believing his path is justified. The outcome and revelation become a double edged sword. A harsh realization that vengeance and the path of revenge does not lead to resolution for his grief. That grief will very much remain alive and active no matter if the serial killer is dead or not. Kim Jee-woon's "I Saw the Devil" is very linear moving thriller with one simple intended purpose however it is presented in a very odd way. It shows the audience all of its cards very early on leaving you to wonder what could possibly come next, then it continues to trump and raise the stakes even further as the film progresses. Rarely before has a film been able to make me think I've seen everything, then repeatedly surprise me after. Kim Jee-woon is a director whom I seek out his work and each time he continues to impress me with his eye for telling a story. An eye that can make an extremely gruesome and action packed tale yet a very calculated and complex tale seem relatively simple and easy.